Happy Thanksgiving!! 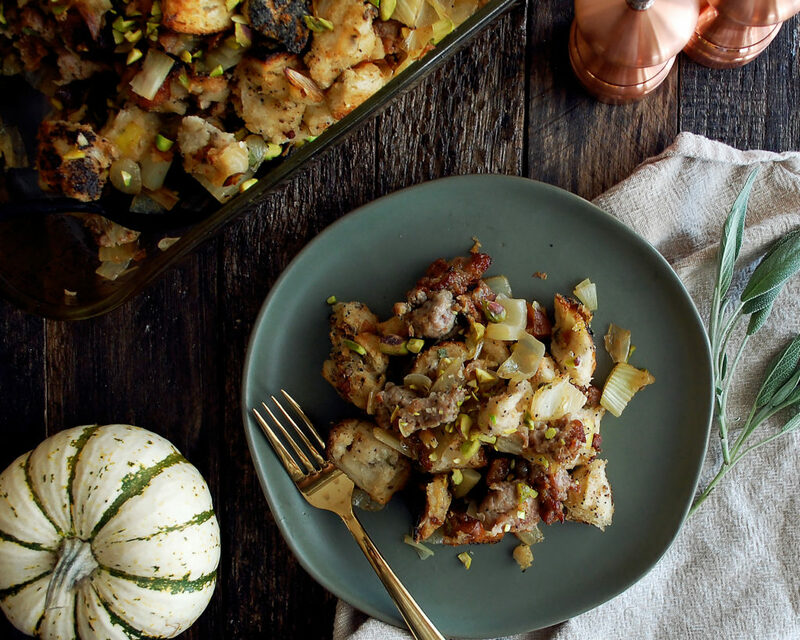 The day has finally arrived, and this Italian sausage & fennel stuffing will be the star of the table! 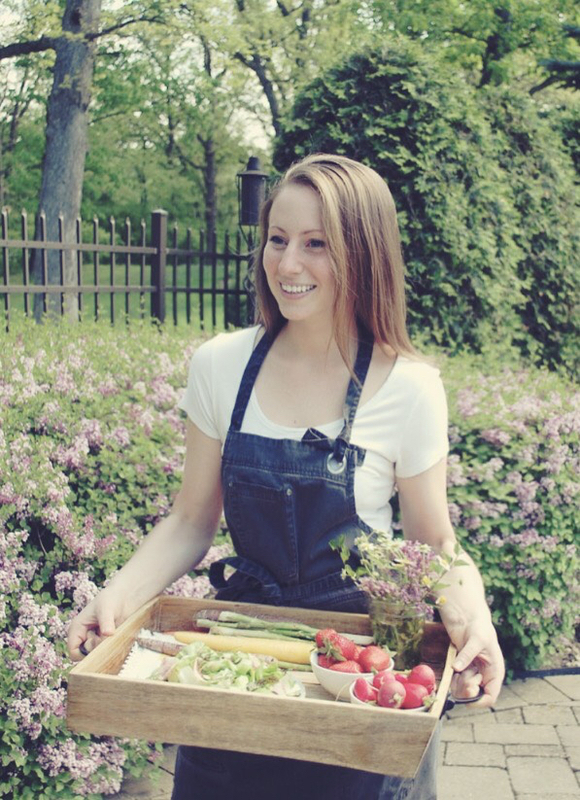 I’m going to keep this post short and sweet, because there is a ton of cooking to get going! We are hosting Thanksgiving here, and that means I will be cooking non-stop starting in about 5 minutes. 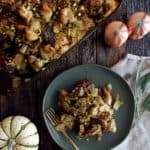 I’ll be making this turkey & cranberry sauce, this mac & cheese, this persimmon salad, these cornbread muffins, this pumpkin cake, and lots more! 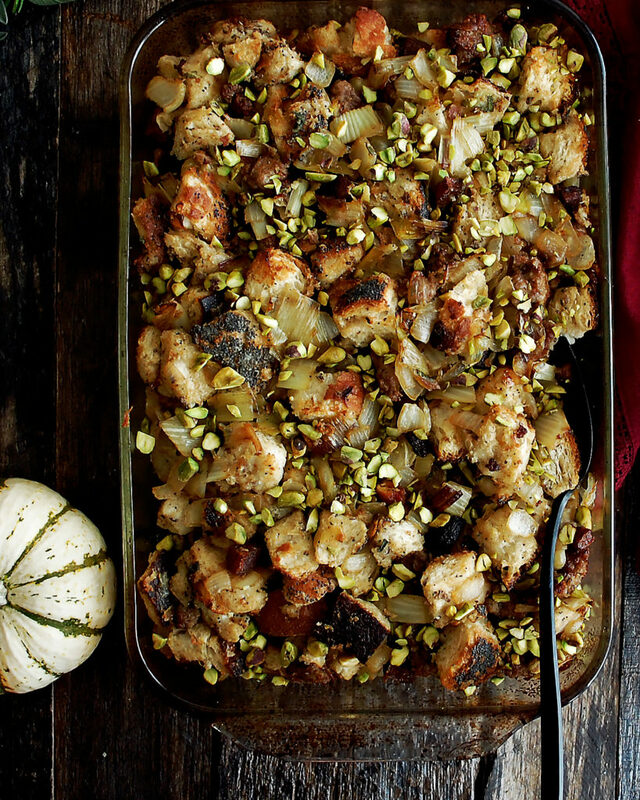 And, of course we cannot forget about the stuffing. This one is so simple and absolutely delicious. 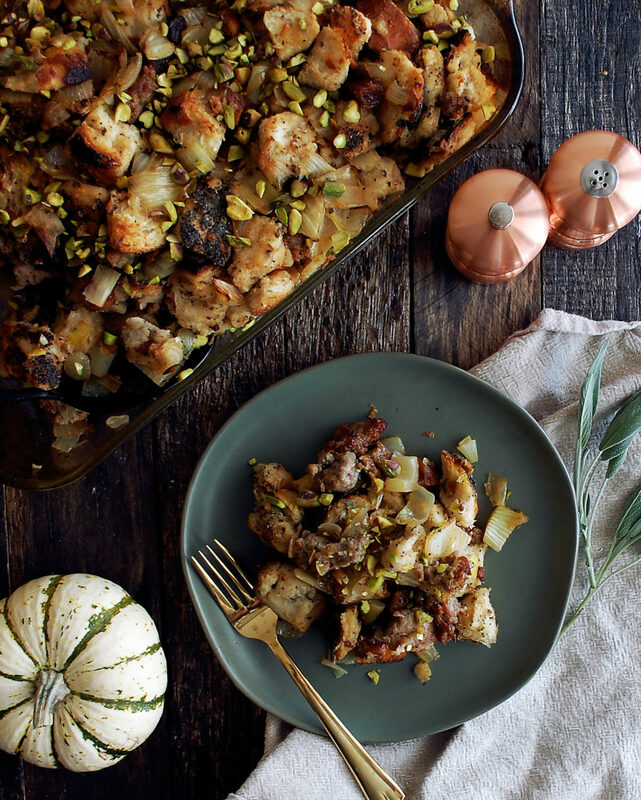 It’s full of caramelized vegetables, italian sausage, sage, crusty bread, and toasted pistachios. Baked until golden brown. Serve it with lots of gravy (and, it makes a really good leftover dish with a poached egg on top). I want to wish everyone a wonderful Thanksgiving Day. I hope you enjoy the time with your family and loved ones around the table. Sharing food is one of the simplest pleasures in life, and I am so glad this day is all about being thankful and sharing a wonderful celebration with each other. Preheat the oven to 300°F. Spread the bread cubes out onto a sheet pan. Bake the bread for 10 minutes. Transfer the bread to a large bowl and pour in the chicken stock, making sure to coat every inch. Let soak for about 30 minutes to soften. Meanwhile, in a large sauté pan, melt the butter over medium-high heat. Add the sausage and use a wooden spoon to break it into smaller pieces. Let the sausage cook until browned and caramelized, about 6 minutes. Use a slotted spoon to transfer the sausage to the bread bowl, leaving the drippings behind. In the same pan, add the remaining butter and let melt. Add the onion, fennel, and leek. Season with a generous amount of salt and freshly cracked black pepper. Add the sage. Let sauté until caramelized, about 8-10 minutes. Add the dried apricots and cook for another 2 minutes. Add the vegetable mixture and toasted pistachios to the bread bowl. Stir everything together. Raise the oven to 350F. Grease a 9×12” baking dish with a coating of oil. Pour the stuffing mixture into the baking dish, spreading it out into an even layer. Bake for about 30 minutes until golden brown.